Today I’m going to show you how to make this Christmas crochet coaster using a very easy to follow step by step tutorial. I’ve always loved and enjoyed making coasters in various designs, expecially for holidays. As usual they are quite easy to work up because, crochet coasters are among the easiest patterns to make allowing you to play with stitches and texture worked in the round. From my experience, I can surely say that coasters are very useful, pretty little accessories that can perfectly fit and decorate your home interior. So, if you’re searching for some crochet coaster patterns for this Christmas, you should check this out. You’re going to love these gorgeous christmas coasters. Please, enjoy yourself and always feel free to share your experience with us in a comment section below. 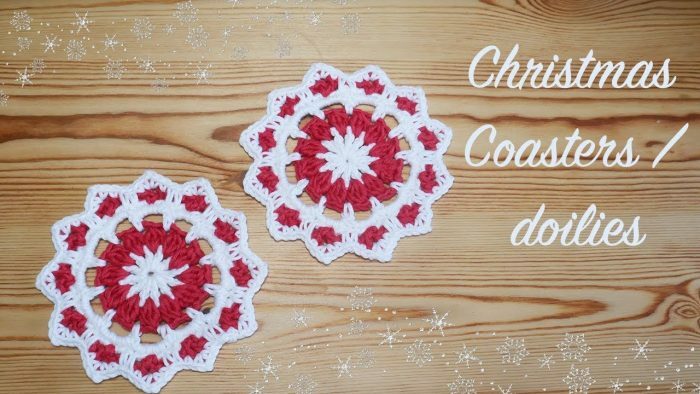 This pattern can be used to make lovely Christmas coasters when using a small hook or larger doilies when using a larger hook. Obviously, they don’t have to be Christmas themed, you can use any colours and make them for any time of year. Good luck and happy crocheting. Beautiful. Perfect for that little present! Loved your tutorial. Thank you.